I sauteed some chopped onion and garlic in olive oil in a pot. Added 4 cups of water and some veggie broth base (I used Better Than Bouillon). 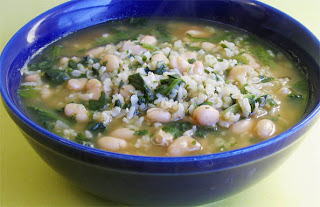 Added about 1 1/2 cups cooked rice (leftover from previous night’s dinner), 1 1/2 cups frozen chopped spinach, and 1 1/2 cups (or a 15-ounce can) of white beans. I brought it all to a boil, then reduced the heat, added some salt and pepper and a little dried savory, and simmered for about 10 minutes. That’s it. It was so satisfying that it’s hard to believe how simple (and quick) it was to make. The moral of the story, of course, is next time you think there’s nothing in the house to eat, think again. 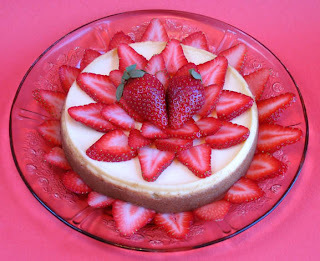 Okay, coming up with a dessert for Valentine’s Day was easy. The great-looking strawberries in the store, plus my husband’s fondness for my vegan cheesecake, made the dessert choice a no-brainer. What to make for dinner was another thing entirely. I knew I wanted to make something different while still keeping the whimsical “heart” theme that I try to do each year. Looking in my pantry for inspiration, I noticed a jar of hot red pepper jelly — as eye-catching and ruby-red as it was the day I bought it at the farmer’s market last summer. With the spicy-sweet pepper jelly as the catalyst for inspiration, I decided to make a sauce combining the jelly with sherry vinegar and soy sauce. The flavor reminded me of a tofu dish I had in a Thai restaurant once. I thought the spicy sweet-and-sour sauce would also go great with sautéed cabbage. Now, I realize tofu and cabbage aren't exactly synonymous with Valentine's Day, but there was no turning back. I sliced a block of tofu horizontally into three slabs, got out my little heart-shaped cutter, and started making adorable little tofu hearts. I made a few out of a slice of seitan, too, and then braised them in the sauce. In another pan, I braised some red cabbage in the same sauce and cooked up some rice. 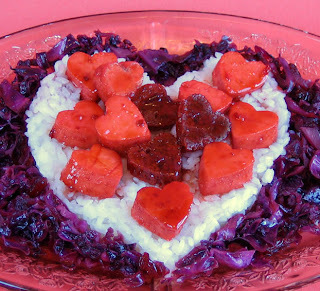 To serve, I shaped the rice into a heart and surrounded it with red (let’s call it “purple passion”) cabbage. I topped the rice with several of the tofu and seitan hearts for a yummy Technicolor meal. Sure, it’s not the most traditional dinner to serve on Valentine’s Day — that’s why I decided to make it a day early! The popular Vietnamese noodle soup is traditionally made with beef, and that’s why my pho is faux. I usually make it with seitan, but when I got a craving for it the other day, I didn’t have any on hand, so I used tofu instead. I can’t seem to keep a supply of rice noodles in the house (I need to start buying it by the case), and I wasn’t about to drive an hour through the mountains in this weather just to get some, so I used cooked linguine (leftover from the day before) to make faux pho and it turned out great — just slightly more faux than usual! This version of pho, the yummy Vietnamese noodle soup, is a sure-fire cure for a cold winter day. Serve with additional hoisin sauce, Asian chili sauce, and soy sauce at the table so everyone can adjust their soup to suit their own taste. This recipe is adapted from a recipe in The Vegetarian Meat and Potatoes Cookbook. 1. Heat the oil in a large skillet over medium-high heat, add the seitan strips and brown on all sides. Remove from heat and set aside. 2. Bring the stock to a boil in a large pot. Add the onion, ginger, hoisin sauce, and soy sauce. 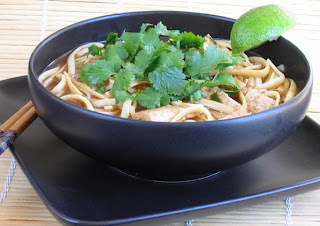 Reduce heat to low and simmer 15 minutes. 3. Remove 1/2 cup of the hot liquid to a small bowl. Add the miso paste to the liquid in the bowl and stir to blend well. Transfer the blended miso paste into the soup along with the chili sauce. Do not boil. Stir in the cooked noodles, lime juice, and the reserved seitan. 5. Divide the soup among individual bowls. Top with bean sprouts, scallions, and cilantro, as desired. Serve at once.